of Tripura State. There are total 73 vacancies available in this TPSC recruitment 2017. Out of 73 posts 69 vacancies for Dental Surgeon and 05 Posts for Excise Sub Inspector. Eligible candidates may submit their application to TSPC on or before 06/01/2018. For more details regarding recruitment of Dental Surgeon and Agriculture Officer jobs see the information given below. For Dental Surgeon posts Dental degree is required as per part 1 and 3 of the dentist act 1948. Preference will be given to the posts graduate candidates have Bengali known candidates. For Excise Inspector jobs must have degree in science. The candidate's upper age limits as on 06-Jan-2018 is 40 Years. For SC/ST/PH candidate 5 years of age relaxation. Selection for this TPSC Dental Surgeon, Excise SI recruitment will be held based personal Interview and preference will be given to the candidates those who are having merit in qualifying examinations. Candidates have to pay this amount at any Tripura Gramin Bank Branches or extension counters and collect the four page color application form while depositing money in the head of Recruitment through the special Deposit slip to the account no 14711 in favor of the secretary, TPSC. Filled application form to submit at the reception counter of TSPC Secretariat by 05:00 pm on 06-01-2018 and must obtain a acknowledgement from the reception. Along with application the candidates have to submit the self attested certificates, ID and address proof, and self addressed cover with Rs.5 stamps. 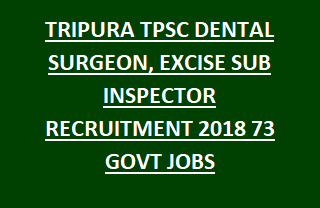 Click here to see the official advertisement of TRIPURA PSC Excise SI, Dental Surgeon Recruitment.